The mens’ and Womens’ Champion Production Section teams with the Link Company maintenance Engineer Pradeeep Chathuranga and Sports Society Secretary Lahiru Randika. The Inter-Departmental Carrom Tournament organized by Link Natural Products (Pvt) Ltd sports society, was held at the Dompe, Malida Factory Premises recently. This Tournament was held as a men’s and women’s combined event. From the eighteen teams that had participated, the men’s championship title went to the production and supply section, while the production section bagged the women’s title as well. Accounts Sections became runner-ups. 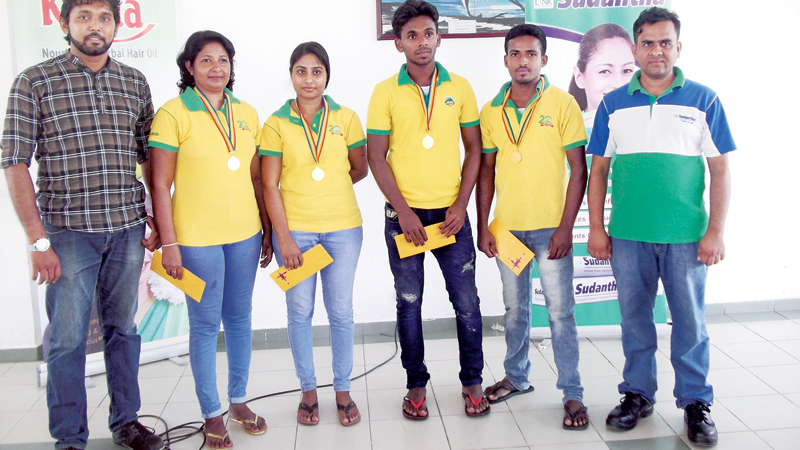 The Champion team players, are Niluka Sampath, Pradeep Balasuriya, Nandika Adikari and Rasangika Wanasinghe. The runners up team players are Asanka Kelum, Dumindu Akalanka, Ayoma Krishanthi and Vishaka Ranatunga. Link Company maintenance Engineer Pradeep Chathuranga and sports society Secretary Lahiru Randika were among the distinguished guests at this event.